No matter how on-point you think you are at maintaining the health and appearance of the skin on your face, you will never be as capable as someone that does it for a living. Which is why you need to bring your mug in for a tune-up with a licensed professional. Should you need further convincing take it from the experts below. Why Should Men Get a Facial? What Skin Problems Are Facials Best For? Celebrity facialist and RealSelf contributor, Graceanne Svendsen narrows in on what you can expect from your facial. “In terms of expectation during a facial, men are in the unique position of having certain skin challenges. They obviously cannot camouflage their skin, and shaving can cause folliculitis. I also feel like there is a bit of a reverse sexism in that men are not as encouraged to care for their skin as women are. Place lower societal expectations on the fellas and no wonder most men don’t consider facials! That being said, I have had a loyal following of men needing and wanting to clean their pores, minimize oiliness, and improve texture and tone. When Should You Start Getting Facials? Should You Ever NOT Get a Facial? 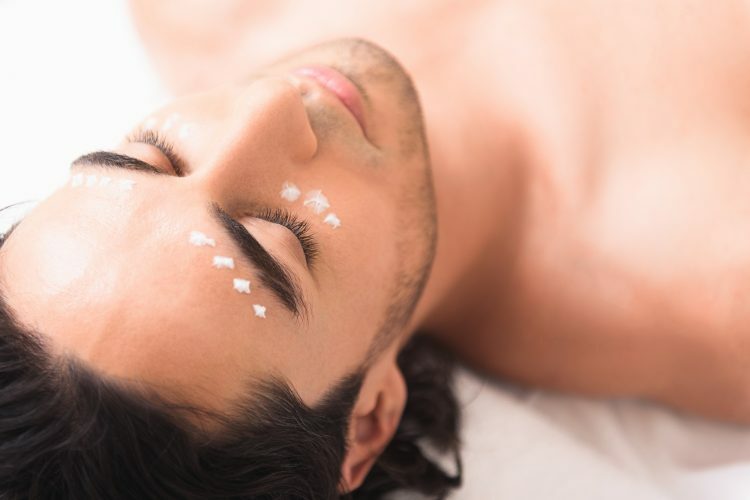 Knowing the benefits is one thing, but what should guys expect when they show up for a facial? I asked Vance Soto of the Ole Henriksen Spa in West Hollywood to walk me through their standard facial procedure. 1. Consultation The consultation is extremely important. We help you to achieve your skin care goals, address your concerns, identify contraindications, allergies, and get to know you! We love to hear about your personal life and get to know our clients. 2. Inhalation breathing Say “spa-aaaaah” and inhale. The sense of smell is so important to relax the body and mind. It’s proven the inhalation benefits of essential oils to relax the brain. 3. Double cleanse Mixture of multiple cleansers. 4. Facial mist Toner to help pH balance the skin. 5. Face, neck and shoulder massage We use a proprietary blend of lavender complexion oils to relax the body, release tension, but also to prep the skin for extractions – my favorite part! 6. Extractions Here we get rid of all those blackheads, breakouts, and whiteheads. 7. Lymphatic drainage Not only do we use manual lymphatic drainage to decongest and for any puffiness but we also use special equipment unique to our spa – it’s relaxing! 8. Peel and Exfoliation We choose the one best suited for your skin – don’t worry it doesn’t necessarily mean you will actually peel but exfoliation is key to glowing skin. 9. Mask + Cold/Hot Therapy Hot and cold therapy allows for better absorption of the antioxidants into the skin plus helps to close the pores and reduce any redness. 10. Serum and Soundwave therapy Soundwave therapy is light vibrations on the skin to stimulate and oxygenate the skin and our serum of choice to treat the skin. 11. Moisturizer To hydrate the skin. 12. SPF Always wear SPF – most of the sun damage we receive happens before the age of 25 so always wear your SPF! 13. Eye Crème Crow’s feet around the eyes are never in. 14. Lip Moisturizer Plump, hydrated, and beautiful lips are always in. Can I Do a Facial At Home? Picone suggests this 6 step regimen for your own at-home facial, ”Our product choices all come from Anthony Brands, a leader in skin care products designed for men. Start with the Glycolic Facial Cleanser to remove excess oil and dirt, follow with the Facial Scrub to remove dead and dry skin cells, next the Purifying Astringent Pads will tone the skin and prepare it for the repairing energy of the Vitamin A Hydrating Lotion. It’s time to let a professional have their way with your face guys, because in today’s world, real men get facials.